Hot Rize has released a new music video, produced by Mason Jar Music, that finds them masquerading as street musicians in the Big Apple. Author David Russell recently approached Pete concerning a book he’s writing on the influence of Earl Scruggs. TV interview in Louisville with banjo picker Terry Heaton. How long did it take Pete to type out his banjo book? British journalist Richard Thompson interviewed Pete “over coffee”, covering a wide variety of subjects. See what Pete names as his “favourite” bluegrass album, composition, and more. Pete Wernick answers a written in question about recent touring with Hot Rize. This premium publication is noted for in-depth features on musicians and luthiers. Issue #29 devotes 21 pages to Pete, his instruments, and his practice cabin/getaway. David Hidalgo and John Fahey are also featured. (more). Videos of Pete and Joan in Russia! The 4-minute report by the U.S. Consulate in St. Petersburg shows a 3-fiddle Old Home Place teaming Russian band Fine Street with Pete and his American group... plus footage of jazz club, radio, and music-for-silent-movie exploits in the Russian metropolis. Read Pete's report, with pictures and video links. Featuring his days at New York's Ivy League school. "Stepping Out With 'Dr. 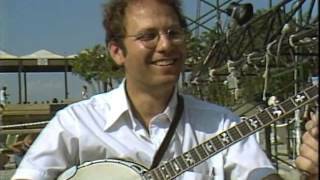 Banjo', Pete Wernick '66"
Pete's report of the planning, preparation and delivery of a historic performance. The one person whose life changed more others' than any in the huge circle of "acoustic" musicians worldwide, has left this earth, and left it a better place. Just a few months ago, I was fortunate to attend a full concert by my hero, Pete Seeger. Here's my report and tribute. After reading that, you might sample my light-hearted tribute written in 2010. This photo, shared by Mary McFaul, Laura Love's manager, is from Merlefest 2006. At breakfast, Pete and Laura sang Amazing Grace. Jen Todd took the photo. Thanks everyone who joined Hot Rize and guests for a memorable night, raising ~ $40,000 for flood relief! Pete talks to Marquee Magazine about the benefit, the flood, and the next Hot Rize album. Nearly two decades after his death, Brian Friesen's name continues to resonate with banjo players around the world... (more). Pete's statement re Earl Scruggs delivered at the request of the International Bluegrass Music Museum. 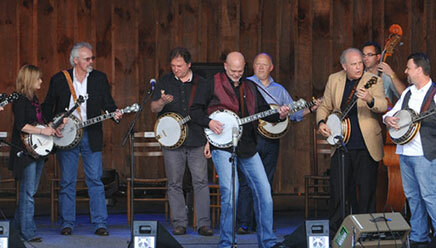 ...at the World of Bluegrass Sept./Oct. in Nashville. 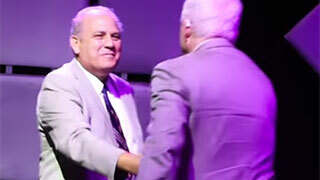 Hot Rize bandmate Tim O'Brien presented the plaque for his "integral role in the wide world of Bluegrass." (more). Today was "tsunami day" here in Hawaii. We got a call from the mainland that woke us up about 5am... (more). Incl. in-depth interviews with Tim, Pete, Nick. (more). As probably one of the few who knew both of these amazing individuals, may I say that there is an interesting comparability... (more). A giant of American Roots Music has left us. Pete's letter to Mike and tribute. What The Wins IBMA CD Cover Design Award! Pete's cover concept and Greg Carr and Sarah Holman's masterful execution took top honors Sept. 30 at IBMA's annual convention in Nashville. The layered flying-saucer/banjo design turned heads and set the tone for the CD's adventurous music. Australian Jamcamper Greg McGrath, a scholarship recipient at the 07 camp at Merlefest, is spreading Pete's jamming gospel! 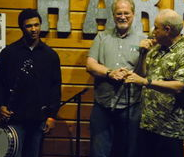 Five student essay winners receive Goodtime Banjos and a performance by Pete and Don. Two essays by Pete are part of the new book Parenting Beyond Belief, edited by Dale McGowan, on Amacom Books. These writings, concerning secular parenting, are Pete?s first on non-musical topics to be published by a major publisher. Colorado Bluegrass "Hall of Honor"
"The Colorado Bluegrass Music Society (CBMS) has inducted Joan Wernick along with four other Coloradoans into the Colorado Bluegrass Hall of Honor. 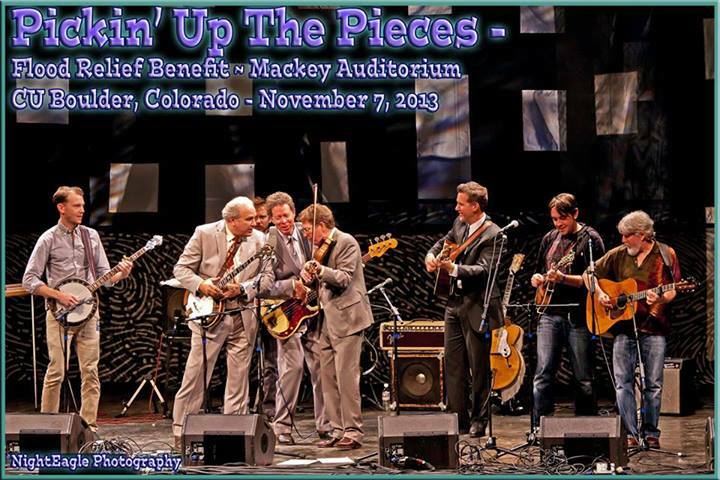 The five chosen for their longtime and significant impact on bluegrass music in Colorado also includes Mike Dow, Craig Ferguson, Dave Patton, and Steve Szymanski." His voice unabashedly penetrates the centuries, hollering, grieving, crying holy, telling stories, sad and strange. 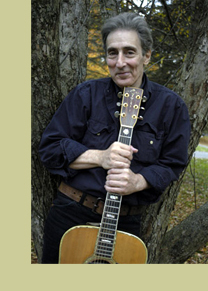 But Ralph is down to earth too -- quiet, humble, ready to enjoy a good laugh, someone who loves to entertain and travel with respect in the world of musicians and good bluegrass folks. And that powerful banjo sound as only he could play it! For the first time ever, Pete has agreed to do a regular column for Banjo Newsletter, called "Let's Roll!". He'll answer questions and give opinions and insights on a variety of banjo topics, as well as an occasional tablature. Pete was asked to write some words about his musical hero for a recent issue of Banjo Newsletter. Listen to Earl Scrugg's surprising remark on recent Etown performance. Louise and Earl Scruggs first met at the Ryman Auditorium in 1946, and in the years to follow, thanks to her steadfast efforts as his manager and booking agent, she watched him perform there countless more times. 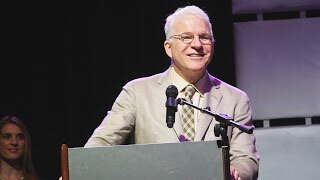 Fittingly, it was at the Ryman, February 6, 2006, that Earl and Louise's family and friends bid her a fond farewell. I flew in the night before, and entered the famed tabernacle as the morning service was starting. The stage was festooned with a large and gorgeous array of flowers. Alongside the casket at the front of the stage were two lovely pictures of Louise, one her high school graduation picture with a red rose in her hair. Scruggs' life can be described as one of dedication. It's hard to imagine a woman more devoted to her husband, and her family. In show business, tight families are the exception, not the rule, and Louise showed the kind of day-in day-out loyalty to her man and her family that never lapsed for well over 50 years in the fray. Judy Banfield had lost contact with childhood friend Pete Wernick until she saw him at a summer reunion last year. Yes, she knew Wernick became a professional bluegrass musician in the mid-1970s. But that was about it. Then an e-mail arrived. Wernick had a gig in Spokane, Wash. He planned to drive the 150 miles from there to Nelson, British Columbia, where Banfield lives. Could she find out if the community had any interest in him performing? Banfield relayed his request to a woman involved in the local bluegrass scene. "You grew up with Pete Wernick?" the flabbergasted woman asked. "You, like, grew up with Dr. Banjo? He is like the king of banjo. 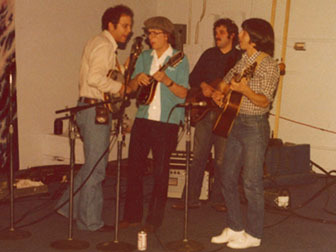 Everyone in North America who has learned the banjo learned it from Pete Wernick." featuring "Men With Banjos (Who Know How to Use Them)"
Our TV appearance got all sorts of interesting reactions in the month after we were on. In emails and at the IBMA conference in particular, so many folks said they stayed up late the night of the show, to see us and root us on. We even had reports of people cheering in front of their TV sets (!) and lots of compliments on the playing, especially Earl's tone! Well, we did it! Five banjos, two guitars, one mandolin, and a piano, playing Foggy Mt. Breakdown at top speed for three and a half minutes. Wouldn't be such a big deal, but in this case something made it daunting - being on the David Letterman show. National TV! Yow! "When you get to the highest levels of the entertainment business," says banjo expert Pete Wernick, "you never know what to expect." He was the lead singer for the Greenbriar Boys, the first nationally significant band to come out of the Northeast. As such, he was a pioneer and a leader for us in the bluegrass generation behind him. I watched him perform at Gerde's Folk City many times, played his records on my college radio program, and enjoyed his heartfelt singing, his deft guitar playing, and his gentle humor. I was about 15 or 16 when I first heard "The Hit Parade of Love", performed by some folks I knew in NY City. They had a cool harmony on it, and it seemed like a pretty upbeat song, with snappy lyrics and good banjo picking. Before long I picked up my first Jimmy Martin record (his second of two at the time), and connected with one of the greatest musical forces bluegrass has ever known. There was a lot to like in the music of the Sunny Mt. Boys. Jimmy's voice had a power and urgency that always got my attention. He grew on you, with a great tone, definitely hillbilly, and absolutely clear and true. Spirited and disciplined at the same time. Pete brought Joan and NYC pickers Gene Yellin (guitar) and Kenny Kosek (fiddle). Steve provided Eric Idle (guitar) and Marshall Brickman (banjo and guitar), and a good time was had! 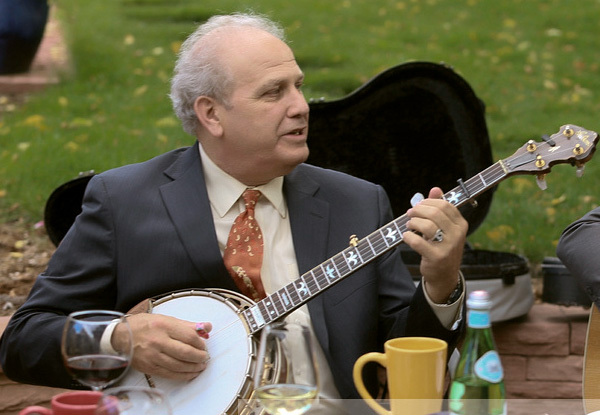 How Pete helped the Washington Chorus' stealth bluegrass band that accompanied a Supreme Court Justice's dancing! on the subject of Bluegrass sound engineers, using the positive example of Frank Edmonson. Pete and Joan Wernick woke up Feb. 27 to hear that a song they recorded more than 25 years ago was being played on Mars. Pete named TOP LOCAL INSTRUMENTALIST by Denver's Rocky Mountain News in their Top of the Rocky Awards. The LIVE FIVE (now Flexigrass) welcome new members Greg Harris (vibes) and Joan Wernick (vocals). 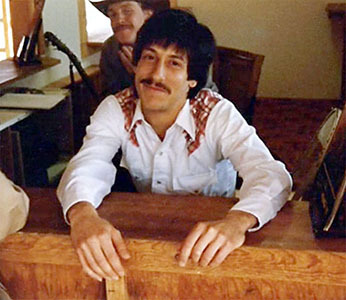 The late, great Frank Edmonson, Hot Rize's fifth member as sound engineer and road manager, has been memorialized with a sound engineering scholarship in his name. Cover story on Pete in the February POW'R PICKIN', the monthly publication of the Colorado Bluegrass Music Society.